I worry that Americans have a tendency to ennoble our families’ immigrant journeys to the point of hagiography. For many, these voyages were messy, hard, and complicated regardless of what cheery Ancestry.com ads might have you believe. Playwright Martyna Majok often writes about the unromanticized plight of contemporary immigrants. She proved with her play Ironbound that she has a keen ear for the tough and tenacious voices of Polish immigrant women and understands life teetering on the edge of laughter and darkness. For her new play, queens, she is equally successful but she expands her purview to include women from Belarus, Syria, Afghanistan, Honduras, Ukraine, as well as Poland. With queens, Majok looks at America’s evolving immigration policy from the point of view of those impacted by it. She focuses on immigrant struggles to move forward with life while abandoning a career, culture, and family. With eleven characters and an extended timeline, Majok shows she can take a personal subject (like in Ironbound) and expand it into a much larger-scale play. Through her characters, in broken English, heavily-accented, she finds poetry and pain, and expresses the triumphs and injustices of women who are so often invisible in our country. In a low-ceilinged basement in an apartment house in Queens, Majok introduces us to a group of women who’ve ended up in these temporary digs. She centers her story mostly on Renia (Ana Reeder) who becomes the long-term tenant in the basement. In 2001, Renia is accepted into the shared dwelling by Aamani (Nadine Malouf) and Pelagiya (Jessica Love), as a roommate replacement for Isabela (Nicole Villamil) who is moving back to Honduras. But there is another story which plays in tandem with Renia’s—that of Inna (Sarah Tolan-Mee) who comes to Queens in 2017 to find her mother who immigrated years before and never returned for her daughter. For their own sake, Pela and Aamani ask for “rent and stories” up front from potential tenants. These women have experienced things they cannot share, won’t discuss, or can only hint at. There are risks at every turn. They have their reasons for why they’ve chosen to live here in this basement with other immigrants who do not share their background. Through this play, Majok makes space for the stories that are hard for these women to tell about themselves. We learn as much from what is said as is left unsaid. There is a sense of the vicious and sacrificial in their persistent survival–a constant sense of fighting to keep their heads above water with an omnipresent feeling of powerlessness. Majok is not afraid to delve into the grayish morality surrounding these women (and their choices) and look at their behavior with an anthropologist’s eye. She works hard to not judge her characters or let the audience easily slide into judgment either. But Majok shies away from none of the ugliness that sets much of the plot in motion. Lest this all sounds difficult to watch, it is not. Though the play traffics in a serious subject matter, Majok still imbues these women with warmth, dynamism, and the tantalizing sensation of something possible just over the next hill. The hope that propels them carries us. They are also quite funny. The political undertones never overshadow the human beings she is writing about. The talented cast runs with the characters Majok gives them. Ana Reeder makes Reina in her early years in New York, reticent and halting in her physical demeanor but aggressive and domineering after 16 years here. Nicole Villamil too must be brash and defensive to protect herself, but she softens in select moments and we understand her inner strife. Jessica Love delivers on comedic relief as the taciturn Pela who grows chatty for one night only. Nadine Malouf can be sage, observant, or resigned depending on her character. If there is a weakness in the play, it comes from the Inna storyline. It can at times feel more a plot device than fully developed arc. There is purpose in the juxtaposition of her plight against Reina’s but it plays as more mechanical than moving. Though the play runs two hours and 40 minutes, Dayna Taymor’s production moves at a clip and the timeline remains clear. The actors carry the set pieces and dress many of the scenes themselves reminding us of the labor of these women to build these spaces for themselves. Laura Jellinek’s set captures the play’s contradictions—the physical confinement pressed up against this hopeful, buoyant anticipation. 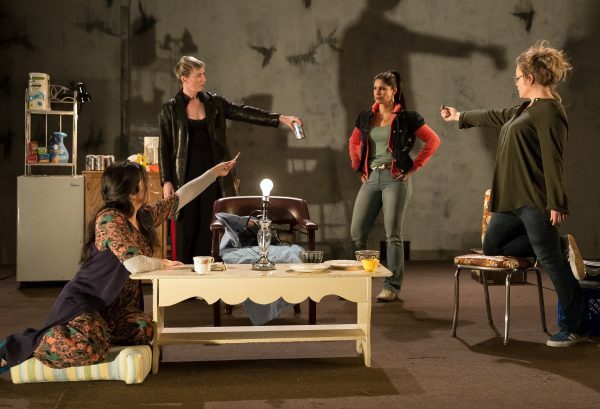 Besides the low-slung ceiling that descends in certain moments to remind us of the oppressive nature of the basement, the back of the set looks like a cement wall with spray-painted wisps of birds as they scatter to the sky. Interstitial music heavy on strings, plays over the scene transitions and reflects the emotional trepidation in the story. queens left me wondering about my own immigrant grandmother and her largely unspoken journey to America. She was a complicated woman, full of secrets, and lies. I gave her a pin once for her birthday. She turned to my aunt and said she wanted to be buried with it. Then added, “So no one else can have it.” Tough, vindictive, warm towards me, and not to be trifled with. So many of her stories were buried along with her and the pin. But queens gives voice to women who’ve traveled a similar path and Majok makes sure we pay attention. Cast includes Jessica Love, Nadine Malouf, Ana Reeder, Andrea Syglowski, Zuzanna Szadkowski, Sarah Tolan-Mee, and Nicole Villamil.